Please note - the oriinal tamper was 3.5" deep. That tamper is no longer made. 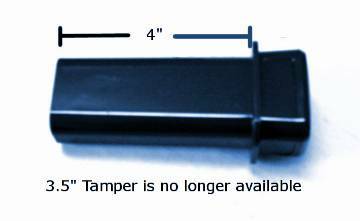 The new tamper is 4" deep and caution must be used when pushing produce into the chute. From Elaine Brewington of Grand Junction, Colorado on 1/28/2019 . The "tamper/pusher" is beautiful! Nicer than the original one I got it to replace. It was nicely boxed, arrived quickly, was a great price. From Rick of Citrus Heights, California on 1/23/2017 .